Where do you start when you’ve decided that you can’t look at the tired old decor in your house any more, and it just has to be decorated? Maybe you fancy a change – or you’ve been watching DIY programmes on TV and fancy yourself as a bit of a design expert? Either way, first you need to think about the room you’re planning to revamp. Looking around the room – what’s the most attractive or main feature? You need to make this your focal point if you are going to decorate. Does the room have a fireplace – these are common focal points and you can arrange the rest of the decor around it. It might also be that sprucing the fireplace up will make a great difference to the feel of the room so attack this project first and then decide what else you need to do. If you don’t have a fireplace or an obvious feature to exploit, you could find an attractive view to direct your eye to instead. Try to imagine the decor from the largest area in a room to the smallest when you’re planning your look. Imagine how you want the walls to look first, then add windows, floors, furnishings, and accessories last. The larger the area you’re decorating, the more impact it has. When you’re planning the decorating, try and set a theme for the room – a palette of colours, a style or an influence. When you’re trying to choose a theme, be guided by furnishings that are already in the room, and decorate around those. Maybe you could use a favourite picture – or design around a rug or piece of furniture already there. Take the main colours from the furniture or picture you choose, and try to build up a theme around it. If you have a picture that’s predominantly soft pastel colours in a room that’s decorated in bright primary colours, it will clash...and obviously if you are decorating a living room you wouldn’t want the sofa and walls/flooring to clash! 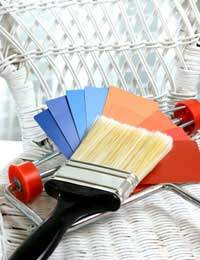 When you’re paining a surface, prepare it first and smooth off any sharp edges. You don’t need any expensive tools for this, just some sandpaper wrapped around a block. Get the right sandpaper and it will make the job easier too. It’s measured in ‘grits’ and the higher the grit, the finer the sandpaper. Start with a low grit for the first phase and then finish off and smooth down with a higher one. Invest in a few good quality paint brushes in different sizes. You have to be accurate when you’re painting door and window frames, skirting boards and around the walls. Make sure you clean them after each use so that they don’t harden – white spirit is the best tool for that job. If you look after brushes, they can last for a long time and you won’t get stray bristles on your paintwork, either! If you’re painting large areas, it’s easier to use a roller than brushes. There are several sizes of roller, depending on the area and finish you’re looking for. You will also need a tray to use when you load the roller with paint. Interior design and decorating are some people’s idea of a nightmare, while others love it. Like most things, once you know the basics, it’s something that can be fun and make a real difference to your living space. The secret with painting is to take care of the woodwork first. When you come to walls and ceilings, begin with the edging, cutting in about six inches from the edge with a brush, to make sure you reach into the corners, and then use a roller. Plan on two coats of paint for proper coverage, and use primer when needed, although in most older houses it shouldn't really be necessary as you'll be covering old paint or wallpaper.